Available on Amazon: An Sci-fi Action novel filled with mystery and thrills. 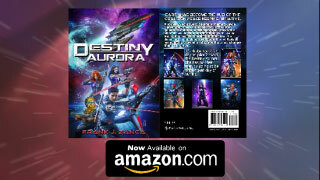 Join the eclectic crew of the Coalition ship, Destiny Aurora, as they set out to find the assassin responsible for the Commander, Jayce Carver's wife. But what they find will be the last thing they expect and may change them all forever. In the vein of Star Wars, Star Trek and Guardians of the Galaxy all rolled up into one. If you're a fan, you'll love the twists and turns and humor of this futuristic adventure story. Logline: Sci-fi/Thriller: A detective takes his crew into dangerous space in order to seek revenge on the alien who assassinated his wife, but when he chases him through a time portal and crashes on Earth on the day of the assassination, he's left with a difficult choice...stop it or allow it happen. Synopsis: Lieutenant Inspector Jason Carver was once Head of Security for the Presidential Senate, but when he failed to protect one of the Senators from an assassin, he was given a permanent leave of absence. The failure still haunted him six years later, since the Senator that was killed was his wife, Anna Carver. When Jason attempted to shield his wife from the blaster bolt, it also severed his right hand, which has since been replaced with a robotic one. The assassin, Kunlore Thorne, was known as the most skilled assassin in the galaxy, but why his wife? The question continued to wrack his thoughts. She had been captured by the Zurathi, an alien race of invaders, who had signed a peace treaty with Earth and returned Anna to him two years before her death. She was never the same after that, but he loved her nonetheless. She became heavily involved in the planetary defense grid, which kept would-be invaders at bay. After Anna's death, he had taken to the bottle, but then became focused on tracking down and eliminating Kunlore. To do that he needed a ship, a crew, and most importantly weapons. Using his former contacts and unused favors, he became a Lt. Inspector in the CSF (Coalition Security Force). Compiling an eclectic crew of misfits with a propensity for loyalty, he set out into the dark reaches of space in CSF Investigator-Class ship dubbed the Destiny Aurora. Detouring to planets known for their black markets, he upgraded the Aurora with illegal weapons. Finally, when he located Kunlore's ship, he chased the assassin through a black hole that brought them back in time. Crash-landing on Earth, Carver fought Kunlore hand-to-hand only to discover that it is his Captain wearing a holographic mask. The man tells him that he is from an alternate time-line where Anna was not assassinated and instead signaled for the Zurathi to attack, broadcasting the code for the defense grid through her speech. He hands Carver the mask enabler and tells him that it's him that needs to make the shot. As Head of Security he is the only one that can get to the Senator. He hands Carver the sniper rifle and tells him that if she lives the Earth will be annihilated. He dies from his wounds, leaving Carver in disbelief. The crew realizes they have been brought back to the day Anna was assassinated. Carver looks down at the rifle and the mask as well as his robotic hand. Was the person that he had been hunting all this time....himself?